The City of Los Angeles Department of Public Works has apologized for producing a video that promotes racial/ethnic stereotypes. An image from the controversial video, which has been taken down from YouTube. 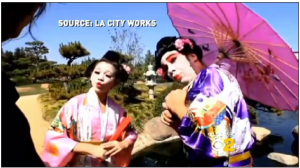 In a report that aired on May 9, CBS2 investigative reporter David Goldstein broke the story of the video — which has since been taken down from YouTube — in which a non-Asian man dressed in kimono and wearing heavy makeup speaks in a mock Japanese accent. It was produced by L.A. CityWorks, which airs on Channel 35, and funded by the Department of Public Works. With the Tillman Water Reclamation Plant in Van Nuys as the backdrop, the actor says, “The Japanese water park is a beautiful, beautiful site, with blooming, blooming lotus and water lilies.” The goal was apparently to teach viewers about recycled water, which is used at the Japanese Garden. There is also a rap music video featuring African American actors. Guy Aoki of Media Action Network for Asian Americans, a columnist for The Rafu Shimpo, pointed out a double standard. “They don’t have the same actor, for instance, putting on makeup trying to pretend to be a black person. There is a certain kind of taboo where, ‘Oh no, we can’t do blackface,’ but it’s okay to pretend to be Asian,” he said. Members of the public weighed in at the Board of Public Works meeting on Monday and will have another opportunity to do so at the meeting on Wednesday, May 15, at 9:30 a.m. at the Edward R. Roybal BPW Session Room, Room 350 at City Hall, 200 N. Spring St. Public comments are first on the agenda. Statements must be limited to two minutes. A security screening is required when entering City Hall. Public comments will also be taken at the following meeting on Friday, May 17, at the same time and location. The speakers on Monday were Sean Yee, a UCLA alumnus; Kathy Masaoka of Nikkei for Civil Rights and Redress (NCRR); and Mark Masaoka, policy director for the Asian Pacific Policy and Planning Council (A3PCON). Excerpts can be seen here. Yee stated that the video was racist and that an apology was inadequate. “It was ironic that the city just held the API Heritage Month event, which celebrated diversity in the city and the API communities’ contributions, on which A3PCON served on the host committee,” Mark Masaoka commented. That event was held on Friday at City Hall. “On behalf of the Board and the Department of Public Works, we deeply regret and sincerely apologize for the production of a video skit that has offended the Japanese American and Asian Pacific Islander American communities. “As soon as we learned of the unfortunate incident, we immediately removed the controversial video and issued an apology to both Dr. Kimura … as well as to the community at large. We will now take further steps to address this situation and to insure that it cannot happen, again. “2. Initiated a personnel investigation to determine the responsible parties and if disciplinary action is warranted. The board’s newest member is Warren Furutani, who has been a leader in the Asian Pacific American community for decades. He said at Monday’s meeting that he had received numerous complaints about the video and that he also found it offensive. The other members of the board are Valerie Lynne Shaw, Jerilyn Lopez Mendoza and Steven Nutter. Meeting agendas are available at http://bpw.lacity.org/.